If you hate the gray hose, now you can replace it! 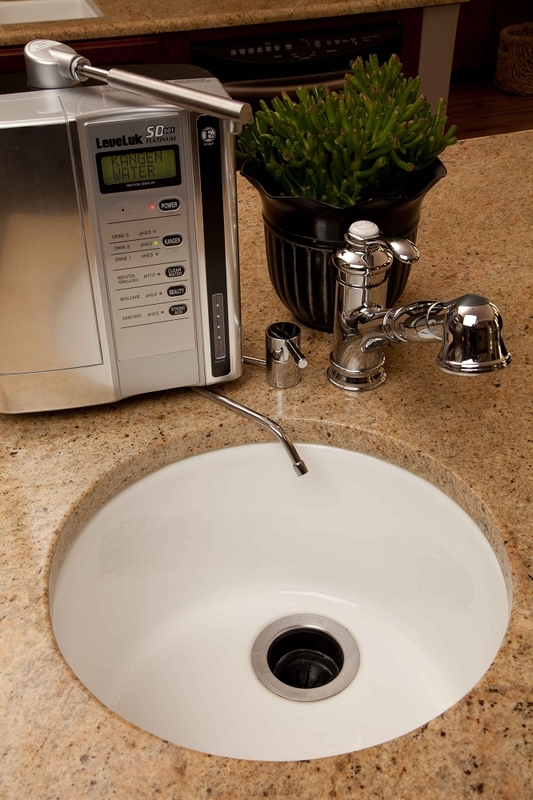 The Designer Drain installs in under a minute and will reduce the clutter and dress up your kitchen. 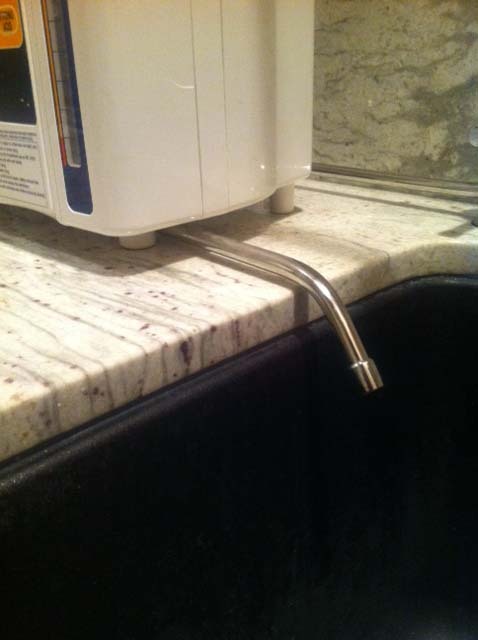 To install it, simply unscrew the gray hose from the bottom of the machine and screw in the Designer drain. It's a beautiful stainless steel tube that telescopes like a trombone and swivels so whether your machine is on the left side, right side or behind the sink, the Designer Drain will work great. Available in Shiny chrome, brushed nickel, white or oiled rubbed bronze. Check out some of the before and after pictures.... and say goodbye to the ugly grey hose. Here how easy it is to install We designed the Designer Drain to eliminate the Ugly Grey Hose and suction cup. Installation is simple. Installation will take you about 2 minutes. Here is a summary of the steps. Remove the enhancer tank Tilt the machine on its back Unscrew the white plastic fitting that attaches the grey hose to the bottom of the machine Screw in the white plastic fitting on the end of the Designer Drain DO NOT OVERTIGHTEN. You do not want to break off any threads. The Designer Drain extends about 3 inches like a trombone, and it swivels Depending on which side of the sink you place the machine you can swivel and flop the fitting so the tube can point in any direction desired. Cleaning the machine is easier to do with the Designer Drain. 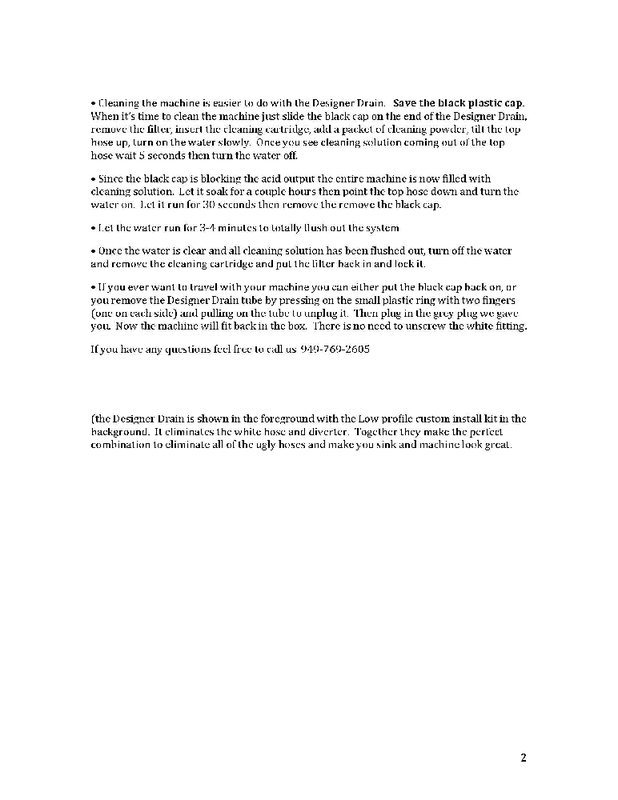 Save the black plastic cap. When its time to clean the machine just slide the black cap on the end of the Designer Drain, remove the filter, insert the cleaning cartridge, add a packet of cleaning powder, tilt the top hose up, turn on the water slowly. Once you see cleaning solution coming out of the top hose wait 5 seconds then turn the water off. Since the black cap is blocking the acid output the entire machine is now filled with cleaning solution. Let it soak for a couple hours then point the top hose down and turn the water on. Let it run for 30 seconds then remove the remove the black cap. Let the water run for 3-4 minutes to totally flush out the system Once the water is clear and all cleaning solution has been flushed out, turn off the water and remove the cleaning cartridge and put the filter back in and lock it. If you ever want to travel with your machine you can either put the black cap back on, or you remove the Designer Drain tube by pressing on the small plastic ring with two fingers (one on each side) and pulling on the tube to unplug it. Then plug in the grey plug we gave you. Now the machine will fit back in the box. There is no need to unscrew the white fitting. If you have any questions feel free to call us 949-769-2605 (the Designer Drain is shown in the foreground with the Low profile custom install kit in the background. 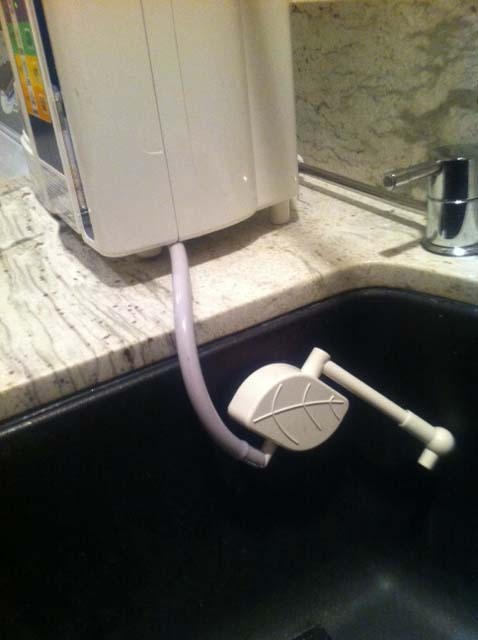 It eliminates the white hose and diverter. Together they make the perfect combination to eliminate all of the ugly hoses and make you sink and machine look great.